The Phoronida is one of the smallest and least familiar phyla; there are about twelve or so living species in two genera, Phoronis and Phoronopsis. However, phoronids -- or "horseshoe worms," as they are sometimes called -- may be abundant in shallow marine sediments at certain localities. Phoronids are elongated and worm- shaped, but the gut loops and ends close to the mouth, instead of passing straight through the body as in annelids and many other wormlike organisms. The mouth is surrounded by the ciliated feeding structure known as a lophophore. The lophophore of phoronids is a simple ring in some species, folded into a horseshoe shape in others, as shown in Phoronopsis viridis above (hence the common name "horseshoe worms"), and coiled in other species. There are no known body fossils of phoronids, probably because their bodies are completely soft. 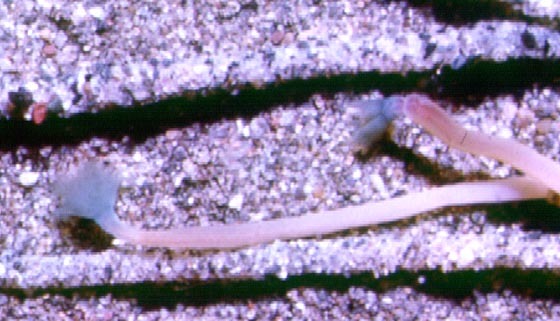 However, some phoronids secrete tubes of agglutinated sediment, as shown here, around their bodies. These might be preserved as fossils, but recognizing the identity of the maker would be almost impossible, since various annelids, arthropods, and members of other phyla leave similar traces. A few phoronids bore into shells or calcareous rocks, making distinctive holes. The oldest phoronid-like boring, which has been given the form name Talpina, is Devonian.